** Hotel San Jose One of the coolest hotels in Austin, and my favorite place to grab drinks and snacks on a warm afternoon. Saint Cecilia An expensive cousin to Hotel San Jose, this bohmian boutique hotel is located in the South Congress (SoCo) District. South Congress Hotel This trendy minimalist hotel has a sushi bar, a rooftop pool, and cool vibes. 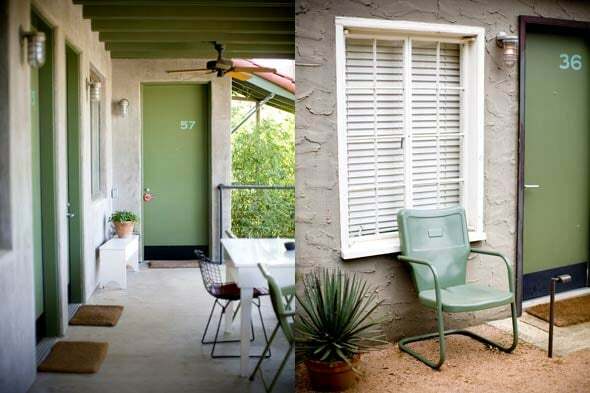 Airbnb Austin has so many good Airbnb's it's ridiculous. These are some of my favorites. ** Elizabeth St. Cafe My favorite happy place in austin for really any meal. Offering french breakfast bites [my favorite is the eclair] and unique Vietnamese plates for lunch & dinner. Epicerie This French "grocery" is bright, healthy and delicious. Their little back porch is perfect for mimosas and beignets. Contigo Modeled after a ranch in South Texas, Contigo has a mix of Texan vibes paired with good drinks and fresh food. Waltons This brick-walled bakery, deli and flower shop is sunny and cheerful inside, and you'll never be disappointed. Hillside Farmacy Antique california vibes and farm to table cuisine – getting a table can take a while, check out Quickie Pickie across the street while you wait. ** Justines An absolute must. French, chic, delicious, festive, takes reservations, is open late [really late]. Go! ** Clarks Our neighborhood go-to, only if we can get a seat at the bar or on the patio. Some of my favorite dishes include the oysters [of course], the shrimp toast, the salmon plate, and the lobster roll. La Condesa Fancy + contemporary mexican on 2nd street. Some of my favorite tacos and margaritas in austin. Bufalina Awesome pizza, cool vibes, great wine. Lenoir Unique and frenchy. the intimate interior and delicious prix fix menu makes any event feel extra special. Backspace Located downtown this little place behind parkside is a good spot to escape the craziness that is 6th street. Launderette New american fare served in a polished space in a converted gas station/laundromat. So many toast options. G'Raj Mahal Great Indian spot with some Austin influence, grab a seat on their patio. East Side King Best asian fusion. ever. Via 313 On the east side, and the most fluffy pastry like pizza you'll ever eat out of a food truck. ever. Patrizi's Authentic, light and decilious Italian food. It has a great patio and shares it with a bar for drinks. Go here for a fun date night or with a big group of friends. It's crazy good! SnoBeach: On a hot summer day a snocone is one of the few things that can cool me down. La Barbecue #2 in the infamous Austin BBQ scene (a very close 2nd). Get in line by at least 10:30am - they have a keg waiting for you on the weekends. They only serve food until they run out, and it unfortunately goes quicker than you'd think. Yes, it's worth it. Micklehwait One of our favorites and doesn't usually have as long of a line. In a very cute food truck too. Freedmens More upscale BBQ spot that takes reservations and serves cocktails. Go for dinner as it is the best bbq option at night. Their back patio is perfect, too. ** Garage Intimate bar tucked inside a parking garage off 6th street. Cozy, vinyl, charcuterie and the best craft cocktails. Weather Up Craft cocktails with hand-carved ice in a vintage setting & huge backyard patio. Whislers Hand crafted cocktails and an epic patio [also try their food truck, thai kun]. Thurs - Sun Mezcaleria is open upstairs and it is straight out of Oaxaca, visit to see the vibe even if you don't like sipping straight booze. East Side Showroom Cocktails in an art filled space that also hosts live music. White Horse Live country music is served up in this upbeat, sprawling honky-tonk with a taco truck outside. 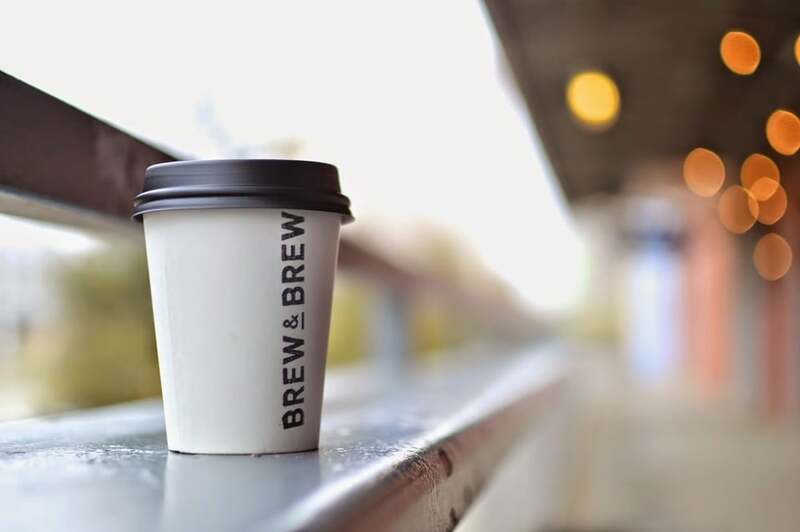 ** Brew & Brew coffee and craft beers on the Eastside, in an old loading deck. This is one of our favorite places. ** My Name is Joe much more than just a coffee trailer. stop by to hear their story, try their food and stay a while. Houndstooth Coffee right in the middle of downtown, this is the best spot to grab coffee and run into the local working crowds. Flitch Coffee east side coffee shop set-up in a vintage trailer with plenty of outdoor seating. Good small bites too. Jo's on South Congress and 2nd St. One of the longest running famous Austin coffee shops. ** Outdoor Voices The best active apparel out there and their flagship store has all kinds of fun stuff to check out. Stag Men's clothing, accessories and home goods. Good Company Shop Home goods, for men and women gear, clothing for women. Olive Vintage clothing, shoes, home goods, and accessories for women. Sunroom Home goods, accessories, swimwear, & clothing for women. Billy Reid Expensive – but awesome men and women's clothing. Feathers Vintage clothing, shoes, & accessories. Lake Austin Getting on the water is one of my favorite things to do in austin, and it's fun all year round. Blue Sky Boat rental is a good company to go through – and there are always deals on places like travel zoo. Mount Bonnell This spot is great for two purposes: a good workout [it's quite the climb to get up to the top!] and a great view for sunset. Grab some take out and find a cozy spot on the cliff to enjoy one of the best views of the lake. The Greenbelt Tucked behind the city is a batch of glorious swimming holes for locals to cool off in the summer heat. After following a small trail, you'll arrive at the pools where you can set up a small camp and picnic, swim, and even bring your pup! Town Lake "hike and bike" Trail 10 miles of trail looping around lady bird lake make for the perfect place to run, bike, SUP, kayak, drink coffee, or just take a casual stroll. One of my favorite things to do when I'm back home. 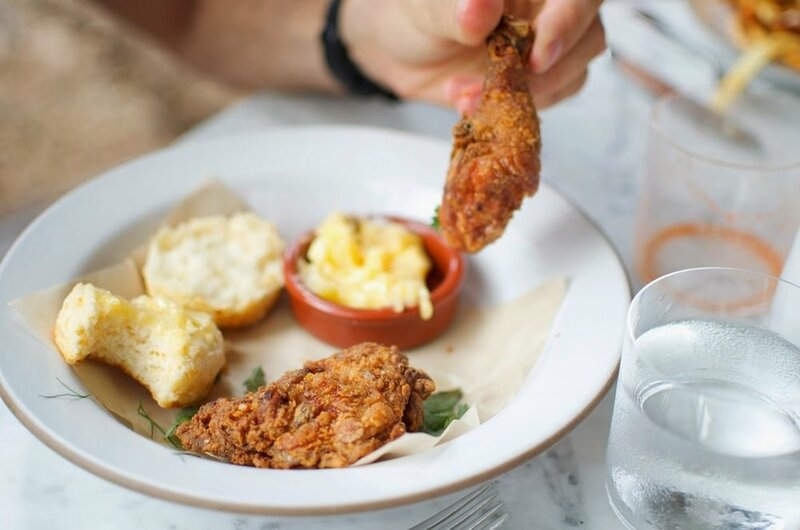 Stop at Alta's to grab coffee, happy hour drinks or snacks. Barton Springs FYI, this spot is cool – but often gets completely overpacked with tourists. i recommend going if you can at a weird time [like maybe 10am on a tuesday], or explore their night swimming during the summer. Otherwise, it might not be worth it. 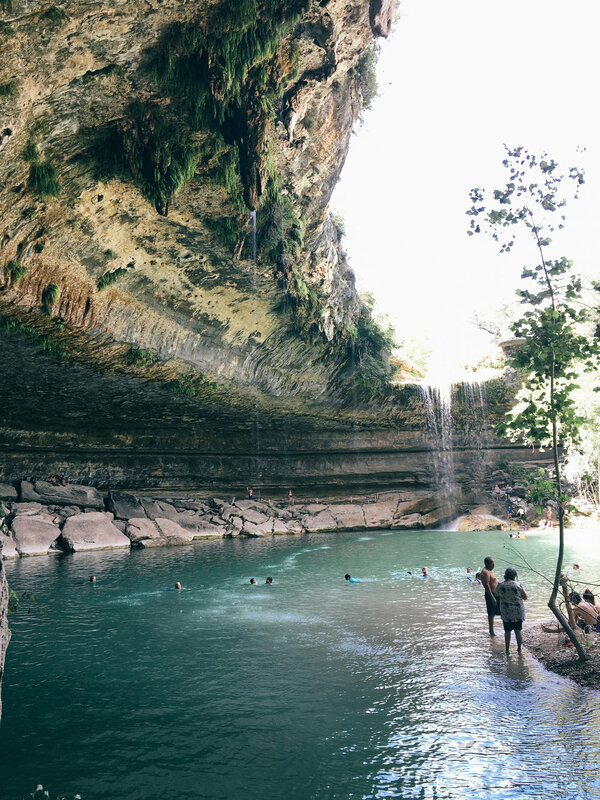 Hamilton Pool [1 hour from downtown] Reservations only – read more about it in this blog post. Blue Hole / Jacob's Well [45 minutes from downtown] local swimming holes that fill up fast, so try to arrive as early as possible. Float the river [and see live music]: this can be a really exhausting day with a lot of moving parts, but it can also be pretty darn fun if you do it right. Read about our most recent float here. Jester King Brewery & Stanleys Pizza Some of the best pizza you'll ever eat, and loads of sour beers to sip on. i love coming here in the fall/winter months when it's not as hot. The Salt Lick A classic austin staple, and even though it has become more and more touristy – it's still a fun experience. Bring some beers to drink in the parking lot while you wait for a table or go wine tasting nearby. The Leaning Pear Our favorite place to stop for lunch after a trip to blue hole/jacobs well. Gruene Hall Either see a show here on a warm summer night, or float the river to catch a show at Whitewater Amphitheater. Driftwood Winery I haven't explored the austin wine scene too hard – but this spot has gorgeous views, delicious wine and very cool vibes. We also like William Chris in Fredericksburg.